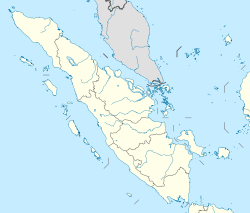 Gayo Lues Regency is a regency in the Aceh Special Region of Indonesia. It is located on the island of Sumatra. The regency was created in 2002 under Statute UU 4/2002 from the northern part of Aceh Tenggara (Southeast Aceh Regency). Its capital is Blangkejeren. The regency covers an area of 5,719.58 square kilometres and according to the 2010 census had a population of 79,560; the latest official estimate (as at 2014) is 83,761. 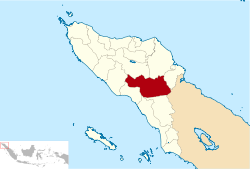 Along with the Central Aceh Regency and the Bener Meriah Regency it is home to the Gayo people. ^ Library Information and Research Service (2004). The Middle East, abstracts and index. Northumberland Press. Retrieved 20 December 2010. ^ a b "Gayo Lues" (PDF). Aceh Investment and Promotion Board. Archived from the original (PDF) on July 7, 2011. Retrieved December 24, 2010. ^ Davies, Matthew N. (2006). Indonesia's war over Aceh: last stand on Mecca's porch. Taylor & Francis. pp. 45–. ISBN 978-0-415-37239-8. Retrieved 21 December 2010. This Aceh location article is a stub. You can help Wikipedia by expanding it.